Although it wasn't as easy as I thought it would be but I succeeded! I cut tons of stars tonight, from both store-bought and homemade Fondant. 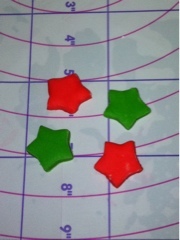 The pretty little stars will be used to decorate my Christmas themed cupcakes this coming weekend. I'm drying them out tonight and will check on how they fare tomorrow. Wish me luck!